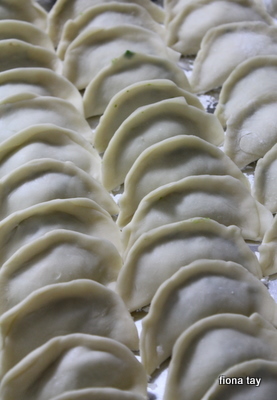 Last weekend, we had home-cooked korean cuisine. The main course made was this Japchae. 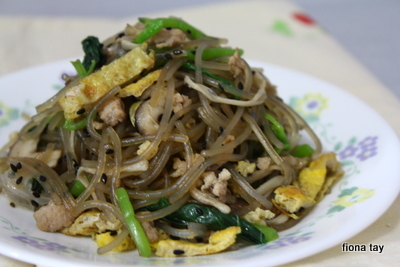 Very appetizing dish and I really love the texture of the Korean starch noodles (you can purchase them from the Korean supermarket). This is an easy dish but it takes up quite a lot of time as you need to prepare and cook almost each ingredient separately before mixing them together. Blanch spinach and wash with cold water. 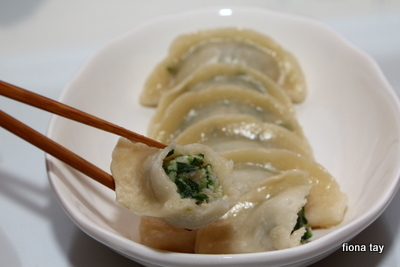 Squeeze out the water and cut the spinach into 2 inches length and mix it with 1/2 tbsp soya sauce and 1 tsp sesame oil. Fry onion slices (cut into thin slices) till soft. Fry chopped garlic, mushroom and mince meat together with some a pinch of salt and ½ tsp pepper. I used truffle oil to fry for this one. Add the seasonings into noodle and mix quickly. Mix in all other ingredients cooked. Hubby was overseas last weekend for work. Had actually planned for a meet up with 2 of my close friends with their boys over at my place but it had to be called off at last minute. Luckily, my parents were free to come over and my mother in law and neighbor were fortunately around to help me eat the 40 over ondeh ondeh that me and Zachary has made. 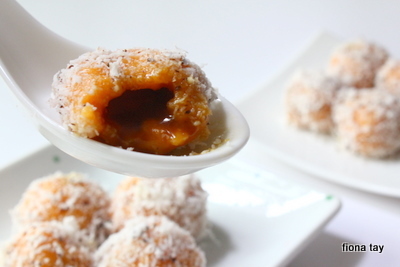 This little sweet treats are best eaten the very day itself as the grated coconut will just turn bad fast. 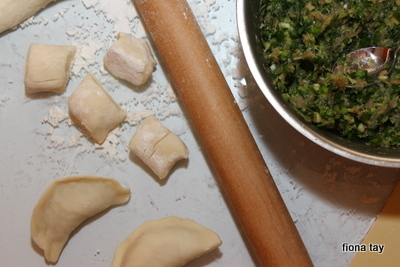 I have attached the recipe here, adapted from seasaltwithfood blog. I have not used the pandan extract as the sweet potatoes I bought has a nice orange color. In a large bowl, combine the sweet potato with glutinous rice flour, all-purpose flour, and Pandan extract and with knead well to form a soft dough. Was happy to see myself being featured once again in Today papers today. Would like to thanks Elisabeth, senior editor of Today for the wonderful interview session and also her kindness for informing and forwarding the pdf version of the article to me. 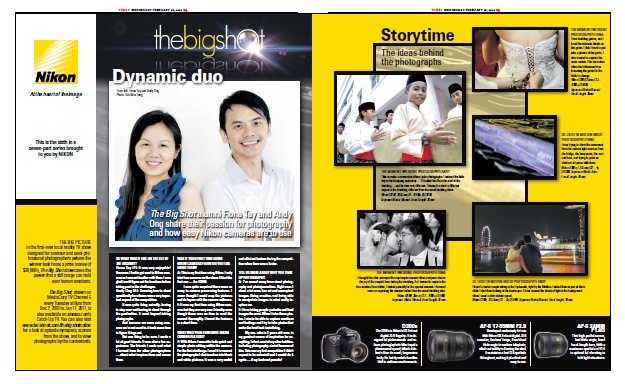 I hope this short interview article of mine will help inspire more of you to take up this wonderful hobby of photography. As like scrapbooking, photography is one great channel of capturing and recording the wonderful moments that you do not wish to forget. Another beauty of a picture is that it can tell a story without words. Happy Valentine day to all of u here. Would like to share with you here the Valentine Day present I made for my hubby this year. I have finally dug out my long-bought printer tray for this project. Also, I have used mainly Prima products for this. 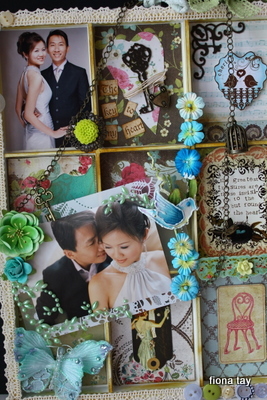 I am truly captivated by the huge range and variety of the new Prima CHA releases especially the vintage trinkets. I bought the chain and flower base plate and notions from local jewellery findings shop and then happily attached the trinkets and the new range of Prima flowers and also the photo mat with the beautiful dollies packaging backing from Prima. Have distressed the tray with brown stazon for a vintagy look and go round the borders with lace. I am hoping to find some time to make a key charm, bracelet and necklace with these beautiful trinkets and flowers. Haha, time to dig out all my jewellery stash in the storeroom. Other than this present, I made him the pig trotters bee hoon for lunch yesterday which is something that we both like. My first time making it. Thought it was little too salty. 1. Soak bee hoon in cold water till it turns from translucent to opaque white. 2. Chill the entire can of braised pig trotters. Let the layer of oil in the sauce harden and turn white. Remove the hardened oil. Remove the bones of the pig trotters. Place the meat and the sauce in different bowls. (I skipped the step of removing the oil; sinful me :P)3. Mix pig trotter sauce, water, oyster sauce, soy sauce and salt in a bowl. Fry shallots and garlic till light golden brown. Add de-boned braised pig trotters and fry with the shallots to draw out the fragrance from the pork. Add cabbage, bee hoon and water-oyster sauce mixture and turn down fire to let it simmer. 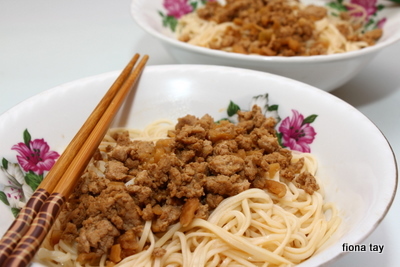 Allow bee hoon to absorb the liquids (takes about 5 minutes). 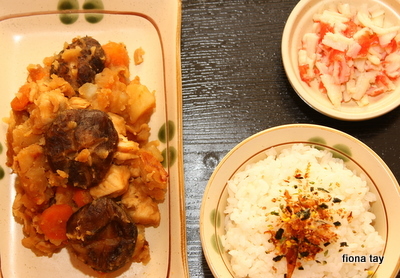 And during the few days of the New Year, I made some New Year dishes. 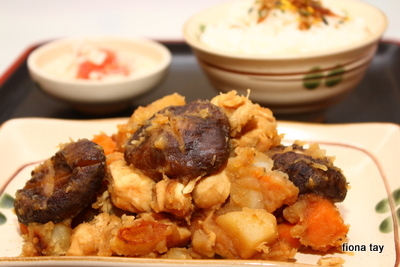 On the first day, I made the Japanese New Year dish which is basically a chicken stew. Usually, the Japanese will use Konnyaku, lotus,bamboo shoots but I have none of these at home. So, I used carrot, potato and shitake mushrooms. The sauce was made of mirin, soy sauce and sugar. And on second day, I made dan dan mian for lunch. I love the sauce which has rice vinegar and home made chilli oil in it. 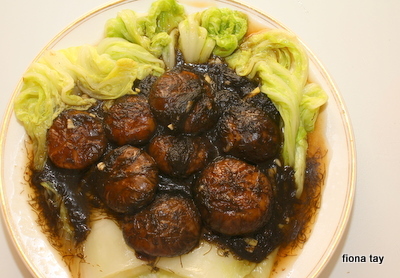 And then on the third day, I made this cabbage with mushroom and ‘fa cai’. I invented the recipe for this one. 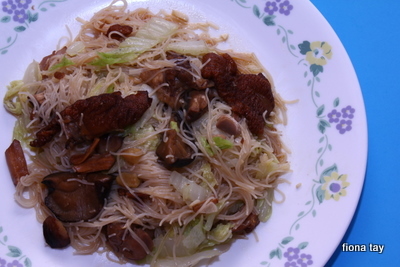 I love the gingerly taste of the cabbage and the oyster sauce taste for the mushroom and fa cai. Blanch the cabbage slightly to soften it a little. Fry ginger slices and garlic with oil and later add around 200ml chicken stock, a pinch of salt, 1 tbsp sugar. When boil, add cabbage and simmer for around 1 minute. Take out the cabbage and add shitake mushroom and fa cai to the remaining stock. Add 1 tbsp oyster sauce mix with 2 tbsp water and fry the mushroom. Add some cornstarch dissolved in water to thicken the sauce. 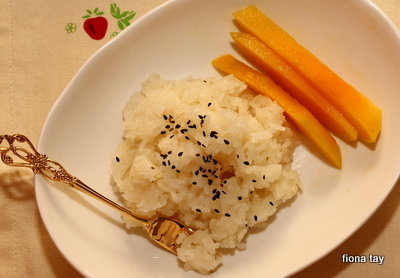 And on the fourth day, I made the mango sticky rice to bring over to my friend’s house. I am glad that they like the rice. Am really happy to meet up with friends and some of the relatives during this festive season and also to be able to find some time to cook for my family and friends during these few days amidst these new year visits. Wishing everyone here a Happy Chinese New Year and a prosperous year ahead. I am more or less done with home visitation except for maybe 1 or 2 more visits to friends’ ones. 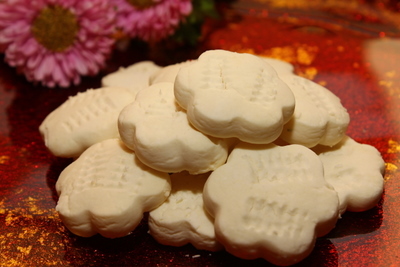 This year, I realized quite a lot of us made new year cookies for ourselves and family members. I think this is a good tradition to keep and to pass on. 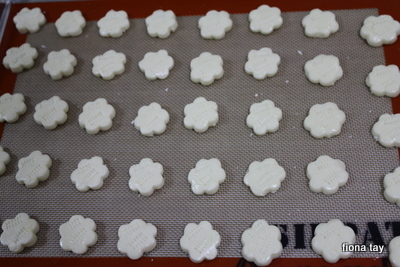 As for me, the weekend before last, I was also occupied with preparation of 2 new year cookies and the Chinese dumplings. 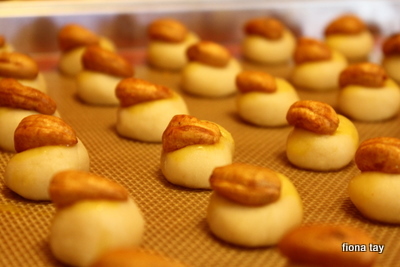 The first one I made was the almond cookies. I decorated with cashew nut on top as I have forgotten to get the almond chips. 1. sieve flour, soda, baking powder and icing sugar. 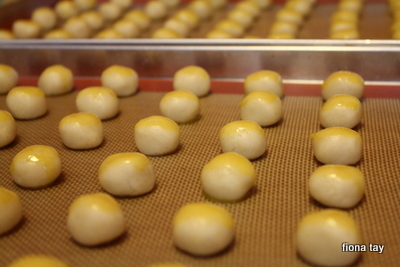 5. bake at preheated oven (180) for 15-20 min. The second one was Kueh Bangkit. The recipe was adapted from ‘Food and Travel’ magazine (Jan issue) and was my first time attempting this notoriously temperamental cookie. It was a failed attempt as I was not able to achieve the melt in the mouth texture. It has something to do with the dough as I could not achieve the look and texture as described. And then I realized I have used thin coconut milk instead of thick one. 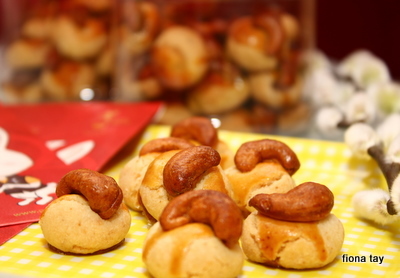 But nonetheless, still taken some pictures of them (look quite nice but don’t taste nice at all). Look out for my next post for more New Year dishes I made. 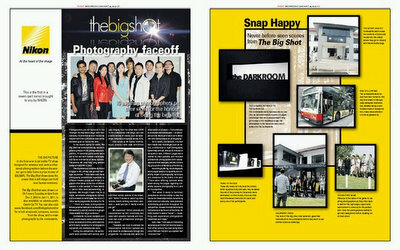 The season finale of the Big Shot was over 2 weeks back after a full 8 episodes over the past 2 months. And as most of my friends have guessed, Liew emerged as the winner. Indeed, Liew deserved the prize. His shots are consistently good and his professional technical skills are evident from all his photographs (not just those taken during the competition; ya, I got a chance to have a look at quite a number of photographs he has taken through the years for leisure, assignment and competition…all making me going ‘wow wow wow’). And talking about Liew, I hope he has not forgotten that he has promised to treat the 9 of us with his cash prize to a good meal. Ho ho ho. But seriously, I am really hoping that the 10 of us could meet up again soon for a gathering. Also, would like to share with you my happiness of acquiring a new ‘baby’. Been eyeing this for very long and it was top on my xmas wishlist for last year. Thanks to hubby who fulfilled my wish and my baby finally arrived last Sat. 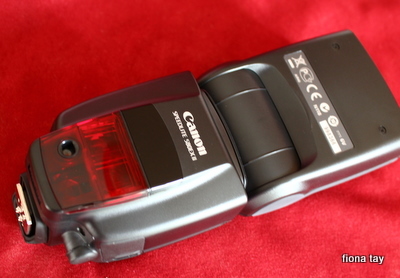 My new ‘baby’ is my canon speedlite EX580II. Finally, I am going to get some better shots of Zachary at indoor and it will be much easier to take with this flash too. My house is always quite dim and this flash is definitely going to help a lot. I am really slowly building up on my photography gear; it’s by far, the most expensive hobbies I ever get into. I don’t earn a lot for sure and so have no choice but to slowly save up to buy these expensive gear. Next on my wish list is definitely the 24-70mm f2.8 lens and hope to get the full frame Canon 5D Mark II camera (when I got my first DSLR canon 550D about half a year ago, I was already tempted to upgrade to a full frame model after only 1 week of crazy shooting with a DSLR; but I told myself to go slow and save up for it). Here’s a test shot in my house which was quite dim and no lights on. Like the result so much.